"We just started cooking with a 30-inch gas grill after decades of using a Weber® charcoal grill. While we still use the charcoal grill, the extra space allotted to us on the gas grill has made us really branch out with different sides. 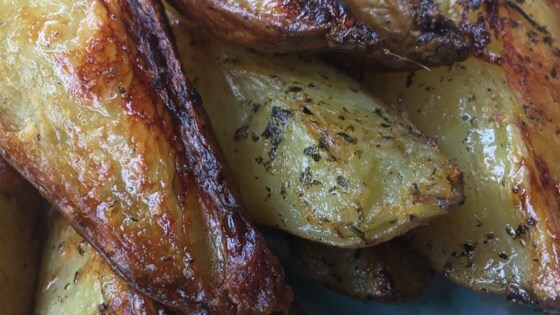 I created this one knowing we could put the potatoes directly on the grill and not have to make a foil packet to make it fit!" Combine olive oil, crushed garlic, chopped rosemary, and chopped thyme in a covered container; let stand for 2 hours or longer. Put potatoes in a large saucepan and pour in enough salted water to cover; bring to a boil; cook over medium-high heat until mostly tender, 8 to 9 minutes. Drain potatoes and transfer to a bowl. Remove garlic from the olive oil mixture and discard. Pour oil over potatoes, sprinkle with garlic salt and black pepper, and toss to coat. Place potatoes skin-side down on the grill over direct heat; reserve remaining oil. Grill for 10 minutes; move potatoes to indirect heat until completely cooked, 5 to 10 minutes. Transfer to a serving bowl and drizzle remaining oil over potatoes. Don't boil the potatoes until completely tender; a knife should meet some resistance when poking the wedges. If they are too soft, they won't hold up on the grill. My new favorite way to make "fries"
Loved it! I cut the rosemary back to 1 T, it can be a little overpowering, but made this as written otherwise. I served this with grilled chicken thighs and a spinach salad. Thanks for sharing. These are the best potatoes ever! I love crispy on the outside and soft inside. Very easy to make...we had fresh rosemary and oregano so we used a spice grinder, then added dry thyme and. I made half the recipe. I also crushed and chopped the garlic and left it in. Other than that, no changes. (Oh yeah, dried thyme) Very very tasty. Even my fussy hubby liked them.